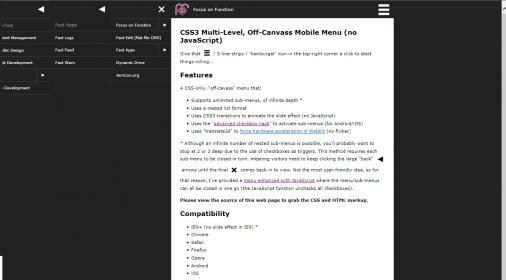 I was emailed the other day by somebody asking if my earlier CSS-Only Multi-Level, Off-Canvas Mobile Menu could be visible on desktop too. Nasty! But how to deal with it?... Well, after a bit of thought, and much faffing with z-index, opacity and positioning of sub-menus, I hit on the idea of using a pseudo element, placed to the left the #menu div, to cover the off-canvas sub-menus... And it worked a treat! Should be fine on all modern browsers and IE9+ (the menu works in IE9 but there is no slide effect). 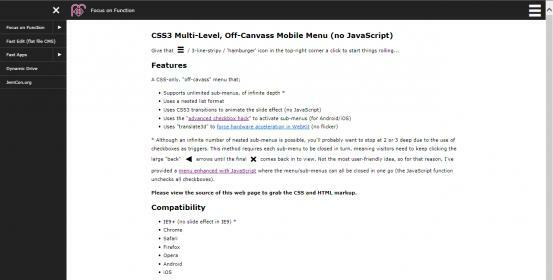 IE8 and under is covered with an alternative fly-out desktop menu.